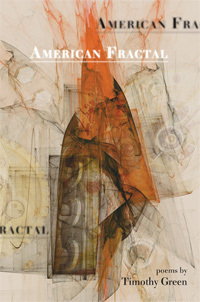 My first book-length collection, American Fractal, is available from Red Hen Press, at the end of the year. Fifty poems, 104 pages. The cover art is a fractal image by Stacy Reed. Looking for the order within disorder, Timothy Green would “wake the body from its only available dream.” Green appreciates how strange this order can be, and that the extraordinary is the hallmark of the individual. In these poems, a man auctions his forehead as ad space, cutlery rains from the sky, spiders devour their mother: in other words, here is life.